How do you use Norethisterone? When shouldn’t you use Norethisterone? Does Norethisterone interact with other medications? Where can I buy Norethisterone? Can I get Norethisterone without a prescription? Do you suffer from painful irregular periods? Normal periods are painful enough, but if you suffer from particularly painful or irregular periods or have endometriosis or another condition with these symptoms then you are likely to be on the lookout for help in the form of medication to alleviate or treat the symptoms of the disorder. Looking to delay the start of your period? There are any number of reasons as to why you might want to delay your period. No time for painful cramps, bloating and mood swings. An important week at work? A holiday you just want to enjoy without the hassle of having your period. I’m sure you can come up with a hundred reasons, but is it possible? It is and there are several solutions, including getting a prescription for Norethisterone. Norethisterone is a form of synthetic progesterone, similar to the progesterone women produce naturally in their bodies. The progesterone can help with hormone imbalance which can alleviate the symptoms of many menstrual problems. Norethisterone is the name of the active ‘progesterone’ ingredient. Norethisterone is commonly known as the period delay pill. You start taking it 3 days before the start of your period and it can delay your period by up to 17 days. This can be useful for a special event or holiday. Your period will come 2 to 3 days after you stop taking it. Norethisterone is used for treating conditions caused by hormone imbalance. It is prescribed to women who are having problems with or who would like to delay their menstrual cycle. It is generally used by women who are of child-bearing age. Norethisterone can also be taken to delay your period by up to 17 days or for the treatment of breast cancer. It can be used for something as simple as preventing your period whilst on holiday or for a special event. Norethisterone is also used to treat breast cancer. 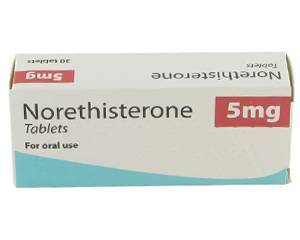 Norethisterone is an oral medicine that comes in 5mg tablets. The tablet should be swallowed whole without chewing and taken with water and food, it is usually taken several times a day for a specific time-frame. The amount you take will depend on the condition you are taking it for, see the dosages section for more information. Always follow the instructions of your doctor. to delay your period – 5mg, 3 times a day, starting 3 days before your period is due. to ease the symptoms of PMT – 5mg once a day for 10 days starting 16 days after the beginning of your last period. Please note the dosages above are given as a guide. You should always follow the advice of the doctor prescribing the medicine when it comes to the correct dose and timeframe for taking medication. Like all medicines Norethisterone can cause side effects, although not everyone taking the medication gets them. If you experience any of these symptoms seek medical assistance immediately. your heart beat is faster than normal. purple or red warm skin on the leg. You should also be vigilant for yellowing skin (jaundice) or eyes as it could be a sign of liver problems, and for migraines if you’ve never had them before. If you experience any side effects, you should consult your doctor. Do not take Norethisterone if you are allergic to any of the ingredients listed on the information leaflet. You should always inform the prescribing doctor of any medication you are taking including supplements and vitamins. Norethisterone should not be taken whilst you are pregnant or trying for a baby. Tell your doctor if you are breastfeeding. Norethisterone should not affect your ability to drive or operate heavy machinery. Norethisterone does not interact with alcohol so you can drink whilst taking this medication. There are no specific medications listed to avoid taking with Norethisterone on the patient leaflet, however you should always talk to your doctor about any other medication you are taking, including vitamins and supplements, so that they can check the combination is ok.
Norethisterone is a prescription medicine, it is not available over the counter without a prescription. Once you have a prescription you can order Norethisterone from any pharmacy or online. The short answer is no, Norethisterone is a prescription only drug. To delay your period, you will need to start taking Norethisterone 3 days before your period is due, so it is worth bearing this in mind when trying to get a prescription and purchase the medicine.